U.S. Secretary of State John Kerry upon his arrival at Moscow's Vnukovo-II airport, March 23, 2016. 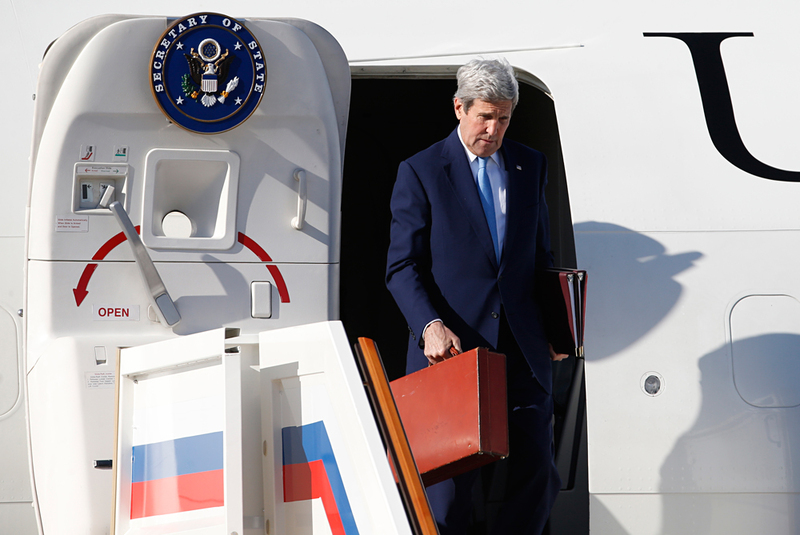 Kerry arrived in Moscow to meet with his Russian counterpart Sergei Lavrov and Russian President Vladimir Putin. Russian Foreign Ministry says this question should be addressed to the U.S.
Moscow does not know yet what agenda U.S. State Secretary John Kerry will bring to Russia, but this will be clear later today, Russian Foreign Ministry’s official spokeswoman Maria Zakharova told a briefing on July 14. Zakharova said this question should be addressed to the United States. "I want to remind you that John Kerry comes at the request of the U.S. side, of his own accord, probably coordinated with the leadership of that country," the diplomat added. "We will find out later today what Mr. Kerry will bring and what Washington prepared for Russia. Tomorrow talks at the Russian Foreign Ministry will be held (between the Russian foreign minister and the U.S. state secretary). Today, as it was already mentioned by representatives of the presidential administration, he will meet with the Russian president," she added. The foreign ministers of Russia and U.S. maintain regular contacts, over the phone and in person, the diplomat said adding that experts of the two countries also maintain dialogue, including on the Syrian problem. "In general, we are always open for exchanging ideas or proposals. We have never left and were ready to consider them on a daily basis, we are maintaining contacts," she noted. "Mr. Kerry knows that Russia is a hospitable country. We always create the working atmosphere, in which constructive talks can be held," Zakharova said. "We never refuse to have contacts, even against the backdrop that is not improving, unfortunately. One might get an impression that someone is trying to neutralize all positive and constructive steps in Washington every time. We will note this and try to make relations more constructive and positive," she concluded.